100-year celebration. 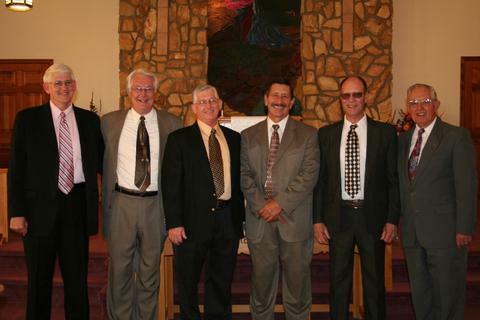 Former pastors: Jodie Hendricks, Hal Sonafrank, Dave Collins, Chester Fisher, Dale Bowman, Curtis Coffman. Leake's Chapel Church of the Brethren was founded in 1906, with the help of John and Sarah Leak who donated the land for the church and cemetery. In November of 1906, the church was dedicated by Henry C. Early with members Charles L. Dovel, J.T. Hilliard, J.R. Good, John W. Leak, and Robert C. Housden serving as trustees. Originally, Sunday services were held just twice a month until the church gained more interest. According to the minutes book kept by Ausby Cubbage, the church was thought to be closed from 1930 to 1933, and only kept opened for special services. The church was reopened in 1933 after a tent revival by I.N.H. Beahm that sparked the interests of several men including Mike Painter, Leo Cubbage, Ezra Dovel, Lynn Dovel, Clarence Housden, and Ausby Cubbage. Cubbage led the church in ministry until 1951. William Rodeffer came to Leake's Chapel in 1952 as a part-time pastor. He worked within the community to gain more interest in the church. Under Rodeffer's 10 year service, the congregation grew to 100 members. Rev. H.E. Wakeman served as minister from 1962 to 1964 with the help of other pastors including Robert Neff, Bill Zirk, Wayne Judd, and Earl Hammer. Also in 1962, Ezra and Beulah Dovel donated land for a parsonage. Construction was finished by 1964, allowing the church to better support a full-time pastor. In 1964, Rev. Curtis Coffman became Leake's Chapel's first full-time pastor, and helped establish the first church board. In 1970, Rev. Andrew Laslo became pastor. In 1977, Rev. Dale Bowman took over the ministry. He and his wife, Karen, introduced the first praise songs to the congregation and helped establish the church directory. The congregation had grown to over 230 members. When Rev. Chester Fisher started his ministry at Leake's Chapel, in 1983, he helped the church expand their mission work to Haiti. He also led the church in building a new sanctuary to hold nearly 300 people in 1986. Along with the help of his daughter, Tammy, Chester helped paint the beautiful mural at the front of the church. In 1993, Rev. Dave Collins came to Leake's Chapel and helped further the ministries of praise music and mission work. In 1998, Pastor Hal Sonafrank began at Leake's Chapel. Sonafrank also lead the church in mission work by starting a church in Africa. He was also instrumental in starting many drama productions within the church. In 2004, Rev. Jodie Hendricks came to Leake's Chapel. Hendricks helped lead the church to installing a much needed new sound system as well as an addition to the parsonage. In 2006, the church celebrated its 100 years serving God. The Homecoming celebration was held in November, as tradition would have it. For the special 100-year celebration all living past pastors were in attendance. In 2008, former Pastor Hal Sonafrank returned to Leake's Chapel to serve as full time pastor. Brother Sonafrank helped lead the church in forming a praise band and installing a power point computer-projector which is used for announcements, praise songs, hymns and sermon outline presentations. In 2011, Pastor Mark Ray came to Leake's Chapel Church to serve as full time pastor. In 2016, Pastor Keith Simmons came to Leake's Chapel to service as full time pastor. The 'E' at the end of Leake's was adopted sometime during the last 100 years. The founding members did not use the 'E' in their last name. No one in the church knows exactly when or why it happened, but it has become accepted as the correct spelling.